Julie joined SVA in 2010. She earned her Veterinary Technician License from Fort Steilacoom Community College with a degree in Animal Technology and got her LVT license in 1985. 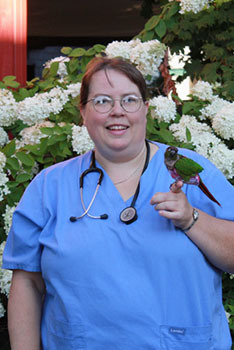 Julie enjoys all areas of Veterinary medicine and has a passion for working with geriatric pets. In her spare time she enjoys cooking, reading, world music, restoring furniture, and volunteering at Northwest Seaport. Julie is managed by two cats: Zeb a Scottish fold Mix and Gusie, a smoke colored domestic medium hair. Both cats met her at the shelter and decided she could take them home. Sometimes they even let her sleep in the bed with them.